FOR ONLY $59, Klondike Air can take care of your air conditioning system! We will run a full inspection of the important components of your home’s cooling system so it’s ready for you when you need it next! We will diagnose your AC system, check your electrical connections, inspect your coils, check your refrigerant levels, test important components, and clear the debris out of your condenser. FOR ONLY $19.00 more, Klondike Air will perform a residential heater tune-up! Our thorough inspection and maintenance of your heating system includes a full diagnostic, tightening of your electrical connections, testing for carbon monoxide and gas leaks and checking your thermostats operation too! Your Klondike service technician will record what he finds and explain to you the condition of your operating system. For just $78.00, Klondike Air can help your HVAC system run better and last longer by avoiding untimely breakdowns and costly repairs. Like anything of value that you’ve invested in, a properly functioning HVAC system needs a bi-annual tune-up and safety check. Klondike has a pre-season Gold Club Service Agreement that will help keep your equipment running safely and smoothly for years of comfort. Priority service during heat waves and no-worry scheduling are just a couple reasons our clients prefer the benefits of Gold Club. So whether you just want a tune-up/safety check or to join the Club, Klondike Air Conditioning Maintenance Service Orange County CA wants to be your “A/C guy”. Klondike’s comprehensive residential air conditioning service and repair evaluation will give you an affordable solution that can save you money on your heating/cooling energy bill, prevent repairs and replacements in the future, and extend the life of your current residential air conditioning system. Our initial air conditioning and air flow evaluation and diagnostics test help us assess your home comfort needs and what you’re looking for in an air conditioning system. We always provide upfront pricing. Additionally, every new residential air conditioning installation comes with an ironclad Klondike Air Conditioning Maintenance Service Orange County CA warranty. Klondike’s warranties are the strongest in the market; New Equipment 10 years Parts and 10 years Labor and 10 years Compressor. Klondike Air’s expert and affordable residential air conditioning repair, thermostat, installation and maintenance services have been meeting the needs of homeowners, property managers, real estate agents and contractors throughout the greater Orange County area since 1989. 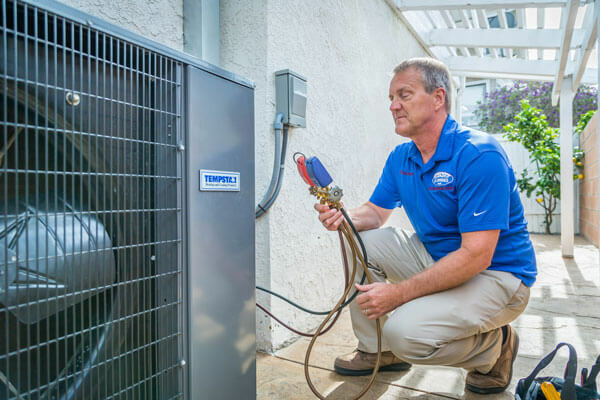 Our highly trained HVAC technicians have more than 25 years of HVAC experience in all aspects of residential air conditioning repair, including sales, installation, repair, maintenance, parts, and services. All of our residential HVAC technicians are EPA certified, licensed and insured.